I mentioned a couple of weeks ago that Callie has Childhood Apraxia of Speech (CAS). We had her evaluated and it was determined that she is a good candidate for an AAC device. We decided to start with a device from DynaVox called the Maestro instead of the iPad for various reasons. Right now Callie sees the iPad as a source of entertainment and I think it might be difficult at this age to change it's use to a speech device (I can see her exiting out of the speech app at any chance she gets to switch to Angry Birds or her favorite Baby Signing Time videos!). Also, you can change the screen sensitivity, the buttons are larger, the speakers are better (louder for places like a restaurant), and it has more customizable options for a little girl's voice. Her SLPs also have more experience with DynaVox devices, so hopefully it will be easier to incorporate it into her therapies. These are just some of the reasons that we feel like a DynaVox is the best place for her to start. If this ends up being a long term solution, I can definitely see switching to the iPad as she matures and gets the hang of using a device for speech. And since we have one, it will be easy to simply purchase an app when the time seems right. They are constantly improving and adding new speech apps, so hopefully we will find the perfect one for her when she is ready. It just arrived and we are so excited to get the hang of it and start using it right away! I have an appointment with the DynaVox rep this coming week for training and am hopeful Callie will quickly catch on and be thrilled with this new way of expressing herself. I will keep you posted! Owen & Callie wish you a very Merry Christmas! Childhood Apraxia of Speech is a motor speech disorder. For reasons not yet fully understood, children with apraxia of speech have great difficulty planning and producing the precise, highly refined and specific series of movements of the tongue, lips, jaw and palate that are necessary for intelligible speech. Apraxia of speech is sometimes called verbal apraxia, developmental apraxia of speech, or verbal dyspraxia. No matter what name is used, the most important concept is the root word "praxis." Praxis means planned movement. To some degree or another, a child with the diagnosis of apraxia of speech has difficulty programming and planning speech movements. Apraxia of speech is a specific speech disorder. The act of speech begins with an intention to communicate. Next, an idea forms, outlining what the speaker wants to say. The words for the desired message are put in the correct order, using the correct grammar. Each of the words are comprised of a specific sequence of sounds (also called phonemes)and syllables that must be ordered together. All of this information is translated from an idea and information about order of sounds into a series of highly coordinated motor movements of the lips, tongue, jaw, and soft palate. The brain must tell the muscles of these “articulators” the exact order and timing of movements so that the words in the message are properly articulated. Finally, the muscles must work properly with enough strength and muscle tone to perform the movements needed for speech. In typically developing speech, children make word attempts and get feedback from others and from their own internal systems regarding how “well” the words they produced matched the ones that they wanted to produce. Children use this information the next time they attempt the words and essentially are able to “learn from experience.” Usually once syllables and words are spoken repeatedly, the speech motor act becomes automatic. Speech motor plans and programs are stored in the brain and can be accessed effortlessly when they are needed. Children with apraxia of speech have difficulty in this aspect of speech. It is believed that children with CAS may not be able to form or access speech motor plans and programs or that these plans and programs are faulty for some reason. The day Callie was first diagnosed with PMG they told us she may never talk. When we went to see Dr. Dobyns in Seattle he told me she may have oral motor dyspraxia. I spent time in the beginning pouring over a blog and book all about about Schuyler, a young girl girl with PMG and no words. It should not come as a surprise that Callie is nonverbal so far, and has now been diagnosed as very apraxic. And yet hearing it from her speech language pathologist (SLP) last week was very difficult. We met for an hour to discuss Callie's slower than hoped progress with speech. We talked about how receptively and cognitively she is so much farther ahead of what she can express. We decided it was time to come up with an alternative game plan for helping Callie with communication before she gets frustrated. In the end we opted to enter the AAC world. 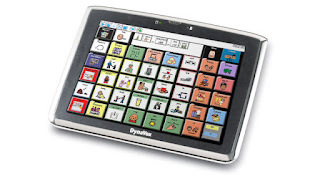 AAC (augmentative and alternative communication) is a term that encompasses the communication methods used to supplement or replace speech for those with impairments in the production of spoken language. 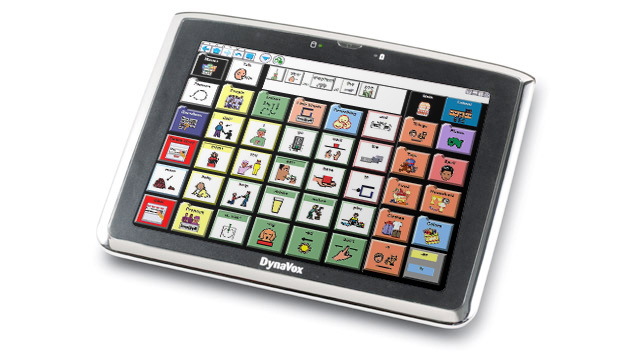 DynaVox is a leading provider of speech communication devices. Callie will be evaluated by a rep from DynaVox within the week. Her SLP thinks she will be a good candidate for a speech device, whether it be a DynaVox or an iPad with an app like Proloque2go. If we go this route, this will only be used as a supplemental tool while we continue to aim for vocalization. I have to admit I have started to lose a little hope when it comes to Callie speaking now that we are 3 years in with such little progress, but while feeling down after the SLP meeting I reached out to my wonderful local special moms group and three moms were quick to offer encouragement through their own stories. One has a daughter with severe apraxia who was nonverbal until almost 6 years old. She also understands everything like Callie. She was given an AAC device in school and it ended up motivating her to talk. She is 9 years old now and talking in 3-4 word sentences. The second has a daughter with severe apraxia and only spoke five words at age 3. She is now 8 and after years of intensive speech therapy she is communicating well. The third explained her daughter spoke her first word at 3 1/2 and did not even babble before then. She is now 5 years old and is a chatterbox, communicating in full, accurate sentences. Such wonderful and amazing stories about these girls! All three encouraged me to hang in there and not lose hope. So I will not. I can't believe our baby girl turned 3 this past month. Like I did 6 months ago, I thought it would be good to recap where she is in different areas. Stats: Callie is now just over 35 inches tall (10%) and weighs 28 pounds (25%). Her BMI is 50%, which really great. Gross motor skills: As you know, Callie started walking this past summer!! I think about this all of the time and have sworn not to take this skill for granted. We feel so blessed that she is independently mobile. She can actually get around pretty quickly when she wants to (walks very fast when chasing or being chased by her big brother! ), although her gait remains abnormal. Her legs still hyper-extend when she does not have her AFOs on. She has pretty much outgrown her current pink pair and we pick up her new purple pair next week. The new pair will have hinges at the ankle which will allow her more flexibility while still preventing the hyper-extension. We look forward to getting them and seeing how they work for her. Dr. Im, Callie's physiatrist, still thinks she has a good chance of eventually developing a typical gait. Only time will tell. I also wanted to mention that she is still hitting milestones in this category... In October she started standing independently from the middle of the floor. Until then she would crawl over and pull up on a piece of furniture. Fine motor skills: Her fine motor skills are improving. She can kind of draw a circle now, albeit a bit sloppy and lopsided. Her biggest accomplishment has been the block tower I recently posted. She loves playing with old spice jars (plastic McCormick containers). She likes screwing and unscrewing the tops, sometimes putting things into the container. She is also helping when it comes to getting dressed, like pulling up her pants. Such a big girl. Speech skills: This continues to be our our biggest area of weakness. She still has limited sounds and no words except "mama", "baba", and sometimes "up-a" for up and "ba" for ball. It still takes a lot of effort to form these words and she will only say them if you prompt her and wait. It's official... Callie is very apraxic. I am going to post a separate more detailed entry about our game plan for dealing with this speech disorder. Feeding skills: This goes along with speech and remains an area of great delay, but again she is making progress. She is eating more during the day and we have started cutting back on her formula at night. She is starting to be able to eat more challenging textures like very small pieces of chicken or steak, but still can not chew harder things like raw fruits or veggies. We received great news on the EoE front this past month. After trialing nearly all foods except dairy, nuts and shellfish, she had a clear endoscopy! This means the advice we received from Hopkins and CHOP was correct... It was beneficial to be more aggressive with food trials and we only have a few more to go. We are currently trialing dairy and Callie will be scoped again at the beginning of January. We are really praying she is again clear because she loves homemade macaroni & cheese! She also tried mozzerella sticks recently and loved them. It would be so wonderful if she could have dairy! We haven't noticed any symptoms indicating the food is not agreeing with her, so we are very hopeful. Social & Cognitive skills: These are still her strongest areas. She continues to be very social and is loving preschool. And she seems to have a little boyfriend! Her teacher sends daily notes home in a notebook in her backpack. Recently a note stated Callie and her little friend kissed in class! We had a playdate recently with this little 2 year old cutie and sure enough, they hugged and kissed when saying goodbye. It was too cute. Cognitively she seems pretty sharp and it's hard to get things by her. She really does not miss much.